The performance and reliability of NDT-CE methods must be assured to establish these methods for standard testing in construction and structure management. To develop and test NDT-methods as well as to investigate their reliability specimens with well-defined properties (defects and dimension) are needed. The design and construction of a large concrete specimen (40 m2) with various fixtures to simulate compaction faults, grouting faults and the variation of dimensions is described. In 2002 a Large Concrete Slab (LCS) was designed and constructed at the BAM-site in Berlin. Practical experience in NDT-testing for more than ten years and urgent research topics from own investigations and applications defined the construction. The concrete slab has an area of 10 x 4 m2 with a regular thickness of 30 cm. The large dimensions of the specimen are necessary to minimize boundary effects on the measured signals and to establish well-defined defects with varying properties. The concrete slab is partitioned in two sections referring to different testing problems. One section contains tendon ducts with different diameters and grouting defects along the prestressing steel. The other section provides areas with varying thickness and voids. Auxiliary elements like thermo-elements, water inlet and reinforcement mats are implemented. In addition ten meters long ducts with 30 cm spacing below the subsurface allow radiography for a detailed reference testing. To gain full information about an investigated area a scanner system has been developed allowing high resolution testing with high reproducibility. The scanner-system can be used for automated impact-echo, ultrasonic-echo, radar and thermography measurements. 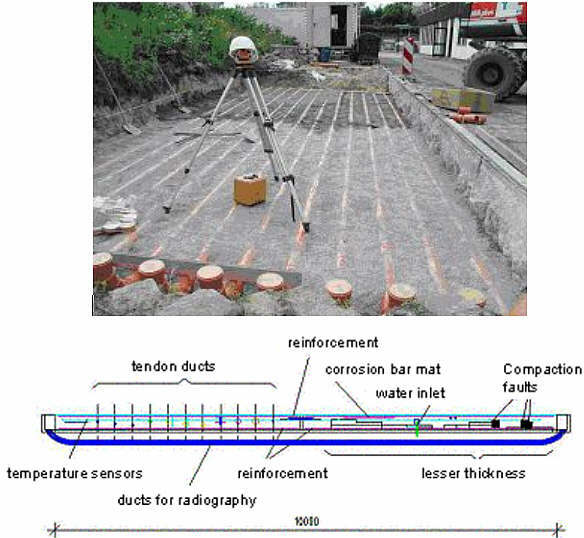 Fig 1: Foundation of the slab with ducts to position radiation sources. The slab has been founded on a basement with 10 m long PVC ducts in a distance of 30 cm (Figure 1). These ducts allow positioning a radiation source approx. 30 cm below the specimen. So radiography is possible for every part of the slab. Fig 2: Tendon ducts with different diameters and duct with grouting fault. Fixtures to simulate compaction faults have been embedded on a determined location (Figure 4). Auxiliary devices like thermo-elements and a steel plate at the backside of the slab are embedded. The steel plate is provided for calibration purposes. 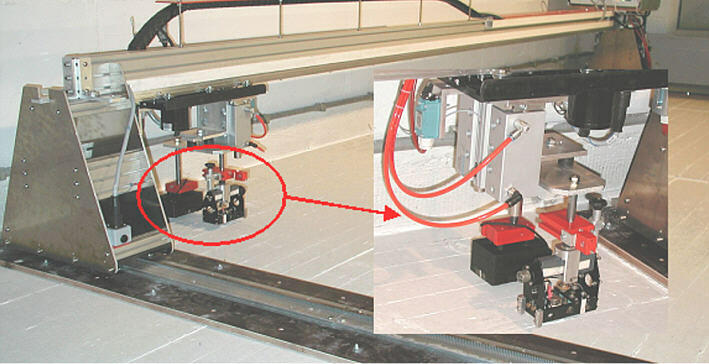 The thermo-elements allow the recording of the temperature distribution in the slab in combination with thermography. Fig 5: Joint with anchors embedded in synthetic resin. An area with different bonding conditions respectively contact conditions between two concrete layers (15 cm each) is also provided. This area consists of five sections (approx. 70 x 70 cm2) with two concrete layers. Acoustic conditions of the boundary can be investigated. A joint over the whole depth between the two sections is arranged (Figure 5). Due to design to transfer transverse force coated anchors embedded in synthetic resin are integrated. The detection of these anchors embedded in resin or concrete and their cover can be investigated. Fixtures like a corrosion bar mat and water inlet are designed to simulate dampness and initiating corrosion. Also choride induced corrosion will be initiated to perform potentialfield testing. A multifunctional scanner system to perform automated radar-, ultrasonic- and impact-echo-testing has been developed. Simultaneously measurements with different methods can be achieved at an effective range up to 4 x 10 m2, whereas the scanner can be arranged on flat areas in horizontal and overhead arrangements. With the scanner system the measuring grid can be varied over a very large range. The high resolution of data points due to a small grid provides a maximum of information about the inner structure. These results of the scanner supported testing methods can be compared with the data from radiography as a reference test method. Hence evaluation and validation of the testing methods, arrangements and performance can be done. Due to this automated data acquisition more reliable data independent of the operator will be achieved and a high reproducibility of measurements is guaranteed. For further information about the scanner system please contact . The well-defined location of voids and geometry allows method comparison and combination (data fusion) as well as calibration of measurement devices. Reference testing with radiography can be performed along the whole area of 40 m2. Gained data can be compared and verified. The test facility can also serve as a reference test -site. Operating personnel can be instructed to guarantee a certain level of qualification of applied testing methods. The LCS is accessible to everyone concerned with NDT to test his equipment. Abraham O., Côte Ph., Thickness frequency profile for the detection of voids in tendon duct, ACI Structural Journal, 99(3), pp239-247, 2002. Jaeger, J.B., Sansalone, M. and Poston, R.W., "Detecting voids in grouted tendon ducts in post-tensioned concrete structures using impact-echo method," ACI Structural Journal, V. 93, No. 4, 1996, pp. 462-473. Jaeger, J.J., Sansalone, M.J. and Poston, R.W., "Using impact-echo to assess tendon ducts," Concrete International, 1997, pp. 42-46.